Based on my experience, the answer to the first question is “we don’t have the slightest clue”. While many firms have customer segmentation schemes, few of them are able to use these segmentations to determine the value (real monetary value, not qualitative judgments) of customers, nor can they even begin to estimate how much they spend across segments. Are you saying they can’t determine customer value – as in for some technological reason, they simply cannot access the data they need? Or they won’t determine customer value – as in they are uninterested / do not understand what value the exercise brings to them / don’t know what to do with the info if they had it? It’s not clear to me how a company could be sophisticated enough to do customer segmentation but not understand customer value…seems like the customer value component would have to be part of any useful segmentation! I’m saying more the former (can’t) than the latter (won’t). But with a good dose of “don’t”. They simply don’t measure how much they spend on specific customer segments. Keep in mind, I’m dealing mostly with financial services firms who focus marketing efforts on products, not customers. So they know how they spend (presumably) on products, but couldn’t tell you how much they spent by type of customer. And the segmentation that many financial firms use is “value” — as in, segmenting customers by number of products owned (assuming the more products a customer has, the more valuable s/he is). Is this “sophisticated” in your definition? I kinda doubt it. A colleague of mine likes to ask our clients and prospects if they “know who their best customers are and if they’re spending the right amount on those customers”. Most people honestly answer “no”. Hmmm…and I was under the impression financial services was one of the places where data-driven CRM was actually generating great payback – Fifth Third, Hibernia cases come to mind. There are a whole list of things I could detail about issues with customer value, but in the end they all roll up to 1: anything you can measure about the customer will be based on actual behaviors. The real value is in their ‘intents’. 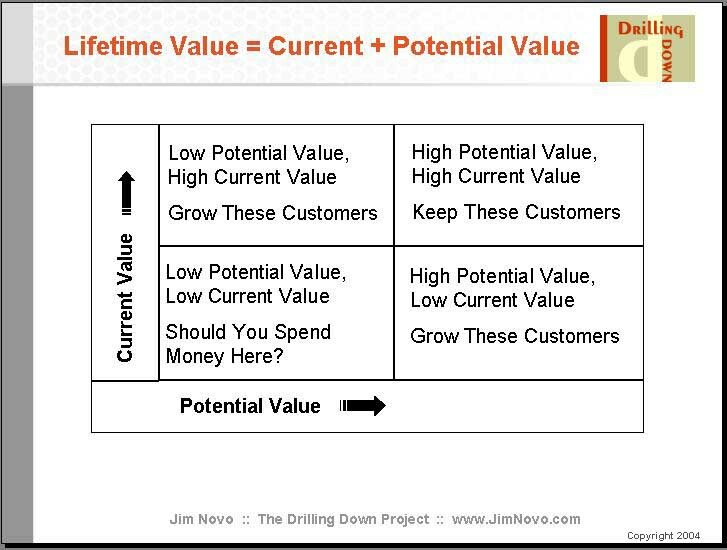 You may have a whole slew of ‘low value’ customers who actually could/should be high-value but because of X (something you have control over but are unaware or too focused on silly other things :), they are not. You may have high-value customers who are still largely undercapitalized. Likewise, as was mentioned (somewhat indirectly) above, if you’re not going to tie the measure to a differentiation of treatment (ala. Frequent Flyer programs and sub-strata within), then it’s of no real value. Does the book address these issues? Which book, Gupta’s or mine? I agree with all the statements you made above. As I said, the Gupta book is a higher level Strategic work, more appropriate if you need to convince people why all this is important – tie it to stock price, etc. Mine is a more tactical book, how to you measure and act on these behaviors? Both books use nearly identical frameworks: customers have Current or Realized Value, and Customers have Potential Value – just like any other asset. 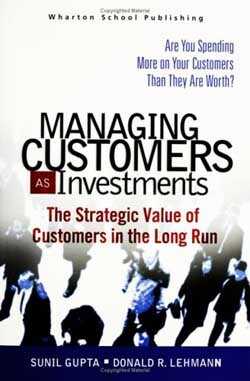 Using these two measures of value, you can operate against the customer base as a portfolio of assets, making financial decisions based on the behavior – both historical and predicted – of customers.